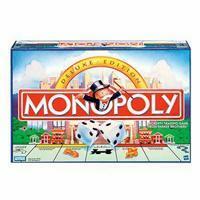 grand gravey: Monopoly goes plastic? Saw an article over at Engadget.com about Monopoly striking a deal with Visa to use mock Visa debit cards and a calculator system to keep a tally of your bank account. I have very mixed feelings about this. As a kid I, like many of my friends, learned how to use money with games such as Monopoly. What will kids learn now, how to keep track of a debit account? Truthfully, it is not a bad idea, just as useful and growing more useful than paper money. I almost never use cash, I use a debit card. So, get a new Monopoly game and teach your kids how to track their bank account! There is no news on the Hasbro website about this, at this time.